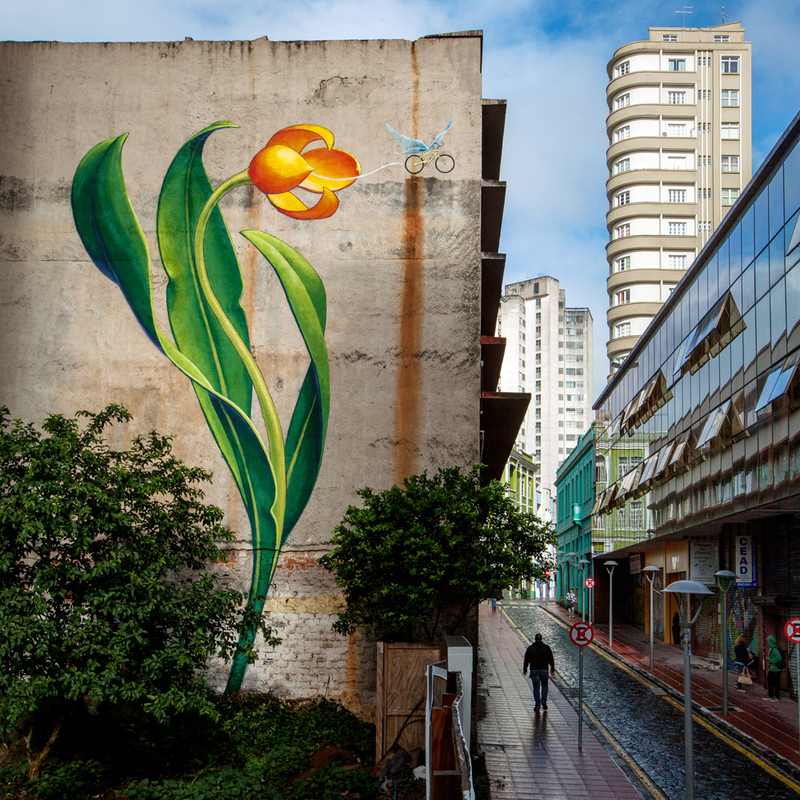 This mural in the center of Curitiba, Brazil, heralded the beginning of a series of grassroots interventions to reclaim and physically transform this long neglected street corner, to reflect the community’s desire for a more livable city. Local activists for bicycling as everyday transportation spearheaded the community’s takeover of this site, as part of their broader advocacy for sustainable urban development. 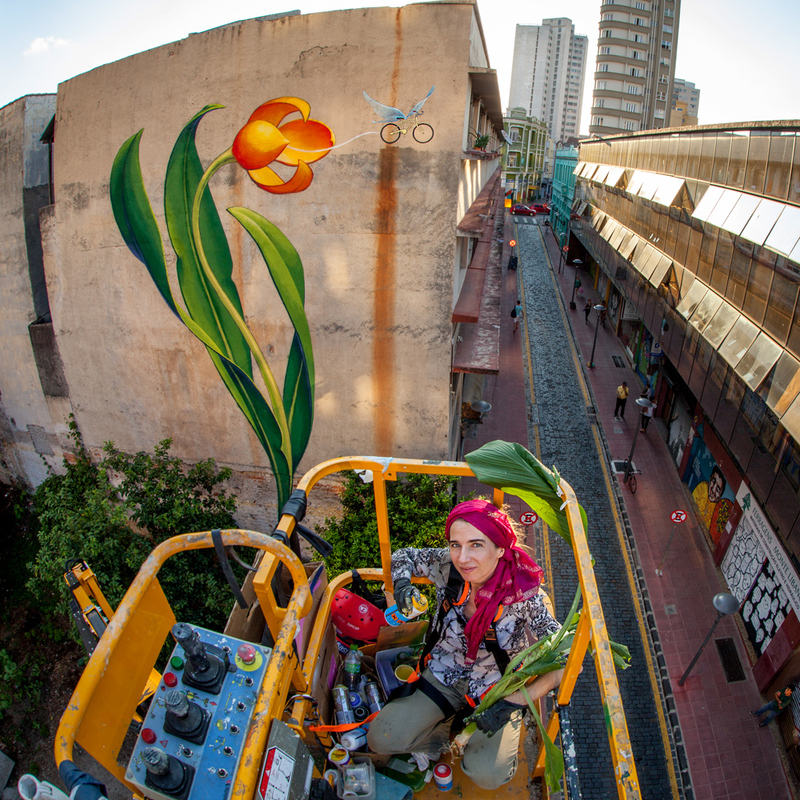 They invited me to create a mural there in conjunction with the third World Bicycle Forum, where I was also invited to speak about my work which shares their advocacy for a more sociable use of public space, often depicting alternatives to car transit as a means to help achieve it. The simple mural image symbolizes a blossoming of the urban environment, one that is giving birth to lighter ways of treading the urban ground. The dramatically large flower was meant to feel like a big drum roll that reveals, anticlimactically, just a tiny little bicycle. The idea is that just a simple, modest thing, like furthering the everyday use of bicycles, can ultimately have a big impact in the urban environment. The next step in the local community’s intervention to valorize this neglected piece of public land was the construction of a new public square in the abandoned lot in front of the mural, designed to be bike-friendly and children-friendly. The City government approved the project but didn’t allocate resources to its construction. So rather than wait for lengthy bureaucratic processes, the Praça de Bolso do Ciclista was built by the community, with their own hands. Among the many inspiring people involved in this example of nowtopian action, I’d like to thank Danilo Herek and Goura Jorge Brand, along with everybody at Bicicletaria Cultural, Cicloiguaçu, and all the local and international participants of the World Bicycle Forum.